Café Grumpy Greenpoint was one of the first premium coffee joints to open in NYC. Since opening its doors in 2005, owners Caroline Bell and Chris Timbrell have added outposts in Chelsea, Park Slope and the LES, as well as an in-house roastery at the Greenpoint location. Grumpy are among the best in the business – and they also do flat whites! No meals, but you can pick up a delicious sweet treat to go with your coffee. They also hold regular coffee cuppings and barista training for anyone who’s interested – check their site for dates and info. Cute hole in the wall, with a little bench outside that’s perfect for watching the world go by. The Café Grumpy Bakery is right next door too. Subway: F to East Broadway or Delancey-Essex St; J, M, Z to Delancey-Essex St.
Close to: Hester St Market, The Sweet Life, Brown, Bacaro. The biggest Grumpy of all, a great spot! Close to: McGolrick Park, Word Independent Bookstore, Five Leaves, McCarren Park. Nice space with plenty of room, and outdoor seating in the summer. No laptops! Close to: Westville (if Elle’s your server tip her good! ), Barneys Co-op, Rubin Museum of Art, Tekserve, Chelsea Markets. Limited seating, but there aren’t many options out here, so no complaints! Close to: Ladybird Bakery, Prospect Park Bandshell/Ballfields, Southside Coffee. 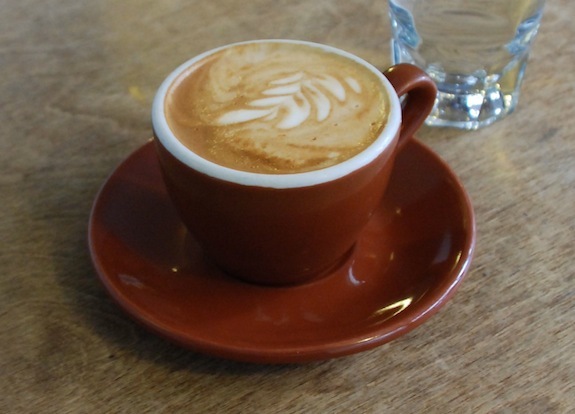 When did flat whites take off in NY? Has it happened since you’ve been living there?